How you are going to react if somebody want you to describe a nagging enfant-terrible as an emblem of pure virtue. Well, believe it or not, online markets have to deal with similar issues as they are often told to take an ugly and pathetically hopeless website for an award winning one. Things get even more complicated, when they are asked to market the website. As you are aware, most websites owners are of the belief that their website is the best website out there and there is nothing ugly about it. Now, this is an uphill task for marketers who are trying to promote this ugly website that nobody wants to have a look at and to encourage people to contact the website owners. It is far more complicated than sending a rocket to Mars. The problem is that it is hard to make people see the truth. There are some people who still believe that the concept of online marketing, more particularity the concept of SEO is largely limited to Link Building and producing meaningless content on regular basis. They tend to turn a blind eye to the obvious that the design and structure of the website has now started playing crucial role in the overall visibility of the website lately. The concept of SEO has moved beyond link building way long ago; it is no more about building crappy links. The concept of SEO has transcended to usability and structure of the website and these two objectives are hard to achieve if your website looks bad. Take for example. Will you browse a website for minutes if it lacks any semblance of beauty and elegance unless the website contains some really good articles and information? Of course not! You will most certainly move to other websites. So, as obvious, if your website does not look impressive, chances are that a vast majority of visitors will never return and they might bounce back within few seconds. This will definitely have a devastating impact on the bounce rate of your website and the average time spent on your website is also going to get affected by this. Some SEO experts are of the opinion that Google is trying to make its search pages more relevant and more effective by moving away from Links. Google seems to be giving more attention to how users are interacting with the websites. The bounce rate of the website, average time a visitor spent on page etc are now playing pivotal role in determining its rankings. Now, all these aspects are intrinsically associated with the look and feel of the website. If people have to struggle to navigate your website or if the website takes too look long time to get loaded, it is highly unlikely that they will stick to your website. 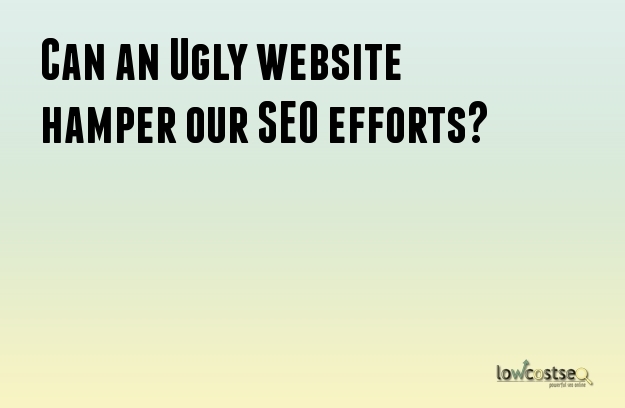 Moreover, people rarely link out to ugly websites and without stretching the truth, we can even draw this conclusion that people also hesitate to share the link of a website that lacks the wow effect. So, the chances of earning natural links are quite low with ugly website and therefore, it makes sense that you should change the look and feel your website to give it a new lease of life.